The tales and travels of the Sugar Creek Gang have passed the test of time, delighting young readers for more than fifty years. Great mysteries for kids with a message, The Sugar Creek Gang series chronicles the faith-building adventures of a group of fun-loving, courageous Christian boys. Your kids will be thrilled, chilled, and inspired to grow as they follow the legendary escapades of Bill Collins, Dragonfly, and the rest of the gang as they struggle with the application of their Christian faith to the adventure of life. 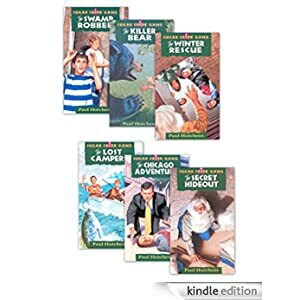 This set includes books 1-6 in the Sugar Creek Gang Series: The Swamp Robber, The Killer Bear, The Winter Rescue, The Lost Campers, The Chicago Adventure, and The Secret Hideout. Buy it today for only $1.99. Suitable for grades 3-6.